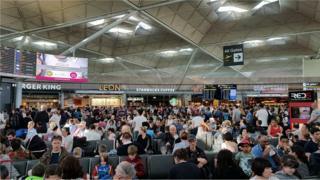 Flights from Stansted Airport have been cancelled or delayed after lightning damaged its fuelling systems.Passengers are reporting major problems, with some stuck on planes awaiting take off and others being diverted.The airport said its aircraft fuelling system was "unavailable" for a period earlier due to a lightning strike. A spokeswoman said engineers had since restored the system but "flights may be diverted, delayed or cancelled". "We apologise for the inconvenience and advise all passengers to check with their airlines for their latest flight updates," she said.